2.4 क्या पूछताछकर्ता को कंप्यूटर के बारे में पता होना चाहिए? [H]ow many different automata or moving machines can be made by the industry of man [...] For we can easily understand a machine's being constituted so that it can utter words, and even emit some responses to action on it of a corporeal kind, which brings about a change in its organs; for instance, if touched in a particular part it may ask what we wish to say to it; if in another part it may exclaim that it is being hurt, and so on. But it never happens that it arranges its speech in various ways, in order to reply appropriately to everything that may be said in its presence, as even the lowest type of man can do. प्रश्नकर्ता: विल एक्स कृपया मुझे उसके बालों की लंबाई बताएं? पूछताछकर्ता: आपके सॉनेट की पहली पंक्ति में, जो पढ़ता है, "क्या मैं आपकी तुलना एक गर्मी के दिन से करूंगा," वसंत का दिन "अच्छा नहीं होगा या बेहतर होगा? I do not wish to give the impression that I think there is no mystery about consciousness. There is, for instance, something of a paradox connected with any attempt to localise it. But I do not think these mysteries necessarily need to be solved before we can answer the question with which we are concerned in this paper. ACM के संचार में प्रकाशित एक पत्र  एक सिंथेटिक रोगी आबादी पैदा करने की अवधारणा का वर्णन करता है और सिंथेटिक और वास्तविक रोगियों के बीच अंतर का आकलन करने के लिए ट्यूरिंग परीक्षण की विविधता का प्रस्ताव करता है। पत्र में कहा गया है: "EHR संदर्भ में, हालांकि एक मानव चिकित्सक आसानी से कृत्रिम रूप से उत्पन्न और वास्तविक जीवित मानव रोगियों के बीच अंतर कर सकता है, क्या एक मशीन को अपने दम पर इस तरह का निर्धारण करने के लिए बुद्धि दी जा सकती है?" और आगे पत्र में कहा गया है: "सिंथेटिक रोगी की पहचान सार्वजनिक स्वास्थ्य समस्या बनने से पहले, वैध ईएचआर बाजार ट्यूरिंग टेस्ट जैसी तकनीकों को लागू करने से अधिक डेटा विश्वसनीयता और नैदानिक मूल्य सुनिश्चित करने के लिए लाभ हो सकता है। इस प्रकार किसी भी नई तकनीक को रोगियों की व्यापकता पर विचार करना चाहिए और एलन आठवीं कक्षा-विज्ञान-परीक्षण की तुलना में अधिक जटिलता होने की संभावना है। "
यह एक एकल संख्या देता है जिसका उपयोग सीधे दो मशीनों में से किसकी तुलना में किया जा सकता है "अधिक बुद्धिमान।"
↑ "The Turing Test, 1950". turing.org.uk. The Alan Turing Internet Scrapbook. ↑ अ आ इ ई Turing 1950, पृ॰ 433. ↑ अ आ इ ई उ ऊ Saygin 2000. ↑ Russell & Norvig 2003, पृ॰प॰ 2–3 and 948. ↑ Descartes, René (1996). Discourse on Method and Meditations on First Philosophy. New Haven & London: Yale University Press. पपृ॰ 34–5. आई॰ऍस॰बी॰ऍन॰ 978-0300067729. ↑ McCorduck 2004, पृ॰ 95. ↑ Copeland 2003, पृ॰ 1. ↑ Copeland 2003, पृ॰ 2. ↑ Turing 1948, पृ॰ 412. ↑ Turing 1948, पृ॰ [page needed]. ↑ Harnad 2004, पृ॰ 1. ↑ अ आ इ ई उ Turing 1950, पृ॰ 434. ↑ अ आ Shah 2010. ↑ Turing 1950, पृ॰ 446. ↑ Turing 1952. Turing does not seem to distinguish between "man" as a gender and "man" as a human. In the former case, this formulation would be closer to the imitation game, whereas in the latter it would be closer to current depictions of the test. ↑ Weizenbaum 1966, पृ॰ 37. ↑ अ आ इ ई उ Weizenbaum 1966, पृ॰ 42. ↑ Thomas 1995, पृ॰ 112. ↑ Bowden 2006, पृ॰ 370. ↑ Colby et al. 1972, पृ॰ 42. ↑ Saygin 2000, पृ॰ 501. ↑ अ आ Searle 1980. ↑ Saygin 2000, पृ॰ 479. ↑ अ आ इ "Artificial Stupidity" 1992. ↑ अ आ इ Shapiro 1992 and Shieber 1994, amongst others. ↑ अ आ Shieber 1994, पृ॰ 77. ↑ अ आ इ Traiger 2000. ↑ अ आ Shah 2011. ↑ अ आ Moor 2003. ↑ Traiger 2000, पृ॰ 99. ↑ Thompson, Clive (July 2005). "The Other Turing Test". Issue 13.07. WIRED magazine. अभिगमन तिथि 10 September 2011. As a gay man who spent nearly his whole life in the closet, Turing must have been keenly aware of the social difficulty of constantly faking your real identity. And there's a delicious irony in the fact that decades of AI scientists have chosen to ignore Turing's gender-twisting test – only to have it seized upon by three college-age women . (Full version). ↑ Colby et al. 1972. ↑ अ आ Swirski 2000. ↑ Saygin & Cicekli 2002. ↑ अ आ Turing 1950, under "Critique of the New Problem". ↑ Haugeland 1985, पृ॰ 8. ↑ Urban, Tim (February 2015). "The AI Revolution: Our Immortality or Extinction". Wait But Why. अभिगमन तिथि April 5, 2015. ↑ Saygin & Cicekli 2002, पृ॰प॰ 227–258. ↑ Turing 1950, पृ॰ 448. ↑ Russell & Norvig (2003, pp. 958–960) identify Searle's argument with the one Turing answers. ↑ अ आ Turing 1950, पृ॰ 442. ↑ Shah & Warwick 2010. ↑ Kevin Warwick; Huma Shah (Jun 2014). 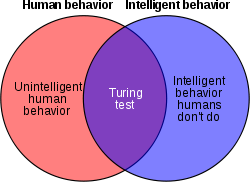 "Human Misidentification in Turing Tests". Journal of Experimental and Theoretical Artificial Intelligence. 27 (2): 123–135. डीओआइ:10.1080/0952813X.2014.921734. ↑ अ आ Russell & Norvig 2003, पृ॰ 3. ↑ Turing 1950, under the heading "The Imitation Game," where he writes, "Instead of attempting such a definition I shall replace the question by another, which is closely related to it and is expressed in relatively unambiguous words." ↑ McCarthy, John (1996), "The Philosophy of Artificial Intelligence", What has AI in Common with Philosophy? ↑ अ आ Bion 1979. ↑ Russell & Norvig 2010, पृ॰ 3. ↑ Cacm Staff (2017). "A leap from artificial to intelligence". 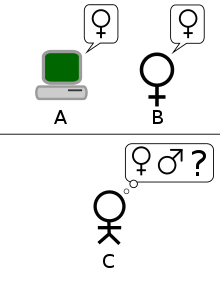 Communications of the ACM. 61: 10–11. डीओआइ:10.1145/3168260. ↑ D L Dowe & A R Hajek (1997), "A computational extension to the Turing Test", Proceedings of the 4th Conference of the Australasian Cognitive Science Society, मूल से 28 June 2011 को पुरालेखित, अभिगमन तिथि 21 July 2009. ↑ Jose Hernandez-Orallo (2000), "Beyond the Turing Test", Journal of Logic, Language and Information, 9 (4), पपृ॰ 447–466, CiteSeerX 10.1.1.44.8943, डीओआइ:10.1023/A:1008367325700. ↑ Hernandez-Orallo & Dowe 2010. ↑ "Prizewinning chatbot steers the conversation". ↑ Whitby 1996, पृ॰ 53. Bion, W.S. (1979), "Making the best of a bad job", Clinical Seminars and Four Papers, Abingdon: Fleetwood Press. Haugeland, John (1985), Artificial Intelligence: The Very Idea, Cambridge, Massachusetts: MIT Press . Saygin, A. P.; Cicekli, I.; Akman, V. (2000), "Turing Test: 50 Years Later" (PDF), Minds and Machines, 10 (4): 463–518, hdl:11693/24987, डीओआइ:10.1023/A:1011288000451 . Reprinted in Moor (2003, pp. 23–78). Saygin, A. P.; Cicekli, I. (2002), "Pragmatics in human-computer conversation", Journal of Pragmatics, 34 (3): 227–258, CiteSeerX 10.1.1.12.7834, डीओआइ:10.1016/S0378-2166(02)80001-7 . Searle, John (1980), "Minds, Brains and Programs", Behavioral and Brain Sciences, 3 (3): 417–457, डीओआइ:10.1017/S0140525X00005756 . 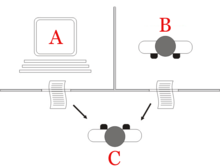 Page numbers above refer to a standard pdf print of the article. See also Searle's original draft. ट्यूरिंग टेस्ट - ट्यूरिंग टेस्ट वास्तव में कितना सही हो सकता है? विकी न्यूज़: "टॉक: कंप्यूटर पेशेवर एलिस का 10 वां जन्मदिन मनाते हैं"